Fortunately, over the years I got more familiar with Sydney and knew where to find decent bread. 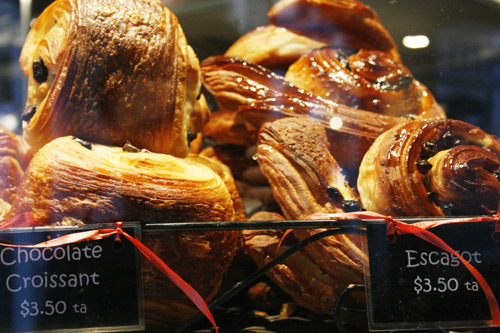 As for the croissants, I have found that no one beats the ones on offer at Taste Bakery. This French-Vietnamese influenced boulangerie/café is so popular that it has spawn a fair few offspring these last few years and can now be found in various spots in the city, but the original one is based on Foveaux Street in Surry Hills, which is where I first got to know them. 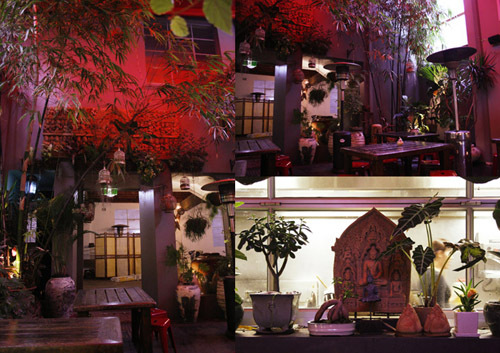 The backyard is decorated with an Asian influence to make you feel like you’ve just been transported into another world, away from the rustle and bustle of the city. The story of this bakery, as per their website, was started by Hieu, a pastry chef and baker, who was working in IT in Sydney and was desperate to find a decent fresh sandwich for lunch. 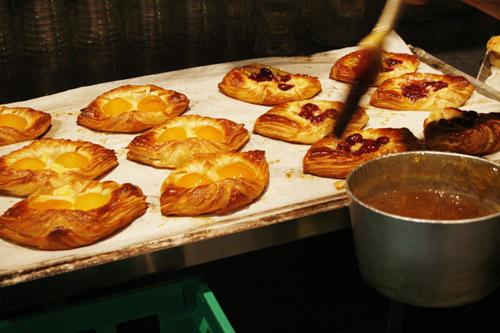 He then decided to open a bakery/cafe where bread & pastries would be baked regularly throughout the day. The bakery is indeed very famous for their Vietnamese rolls/sandwiches, which, I hear from trusted sources, are fantastic (I have unfortunately never tried them as I don’t work in the area). 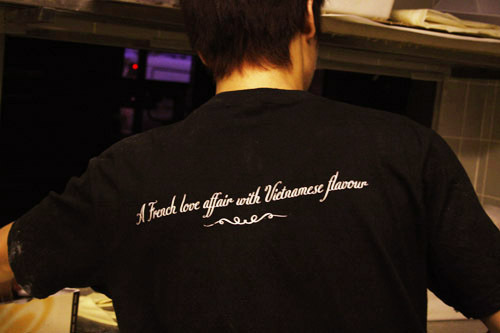 The French have indeed left their culinary mark on Vietnamese palates. French-influenced cafés, bistros, restaurants can still be found in Hanoi and baguettes and coffee are part of the Vietnamese every day diet. Ever since I started this blog, I knew I had to include Taste’s croissants, as they really are for me the best around: buttery, flaky, crunchy and meltingly soft. 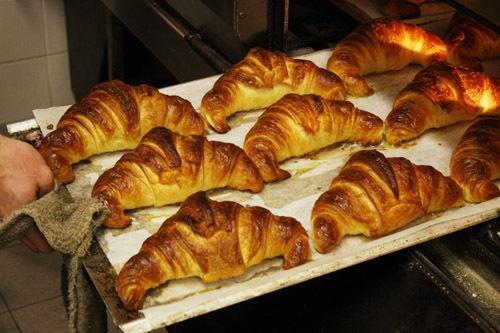 When I brought some to work a few years back, all I could hear was munching noises and approval grunts… coming from an all French team, and therefore croissant connoisseurs! A colleague went as far as saying that these croissants were even better than the ones we could find in France. There and then I was put in charge of bringing Croissants every Friday after that! That is why a few weeks ago, I asked Thi, their store manager, if she would allow me to take pictures of how they make the croissants, as I thought it could be interesting to get behind the scenes of this busy bakery. She responded positively and a few weeks later, an appointment was organized for me to take pictures of the croissant making process. I arrived at the bakery on a Friday late afternoon to watch one of the bakers, Dat, at work on his night shift. I was already exhausted after only a couple of hours of taking pictures, so I don’t know how he can work through the night! Boulanger is tough job! He first mixes the flour and the yeast, than add the rest of the ingredients and lets the machine mix it for about 10 minutes. 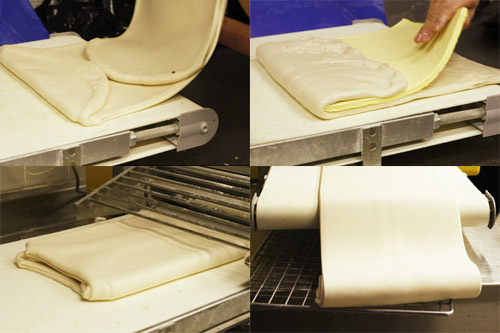 The dough is then placed on the bench, divided in several parts, then put it in the fridge overnight to be worked and cut into croissants the day after. 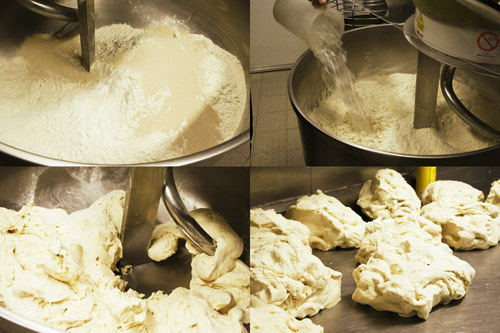 Therefore Dat uses the dough made the day before to make croissants. He first takes a sheet of butter and puts it through the machine to make it slimmer. 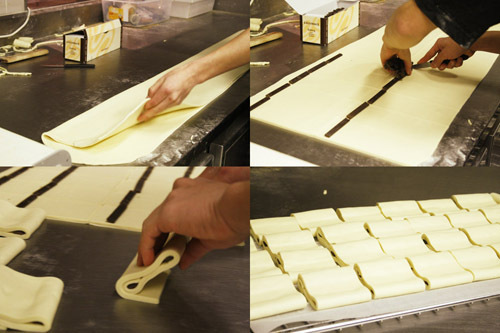 He then does the same thing with the pastry, folds it, puts it through the machine and repeats this process several times. 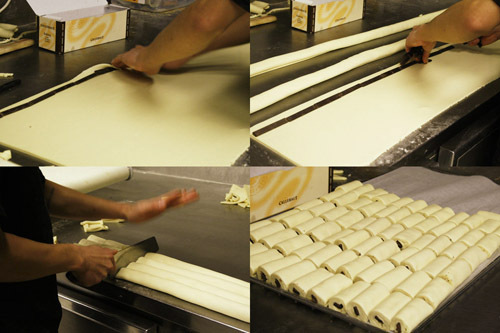 He then encases the butter inside the pastry, folds it around the butter like a little parcel and rolls it again through the machine, until it becomes a long sheet of pastry. He then proceeds to cut little triangles of pastry, which he then throws against the bench and rolls in an expert manner, so quickly I barely have time to photograph it! 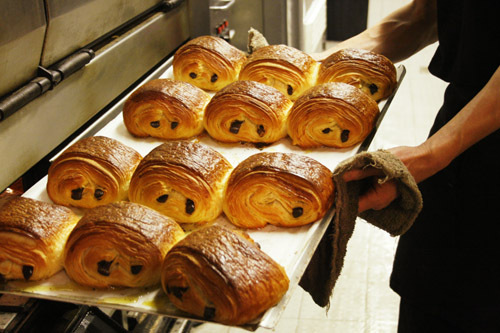 The chocolate croissants are also quite fascinating to watch. 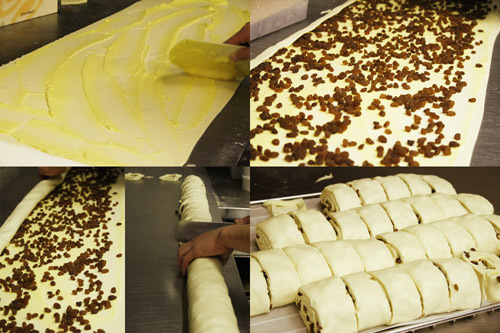 After rolling the chocolate batons into the pastry, he pounds them in with his palm. … then the mini ones. Next comes the Escargots/Snails (or “Pains aux Raisins”), where he spreads some Crème pâtissière onto the pastry, then sprinkles some dry raisins on it and rolls it and chops it. He repeats the same process for the mini snails, but with some chocolate chips this time. He then places everything in the fridge for them to be ready to bake in the morning. Monday morning, I arrive at 5:45am (argh!) to watch the croissants being baked. 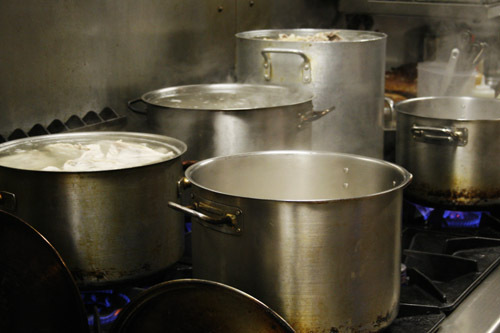 I can see on the other side of the kitchen some big pots of stock cooking for Pho soup, it smells pretty good… The Chef tells me that this Pho is pretty unique in Sydney, as it is made with organic freerange chicken. I make a mental note to go back one day for lunch to have a taste! The Baker, Manh, is starting on the breads, chopping the giant mass of dough into regular smaller loaves and baguettes. 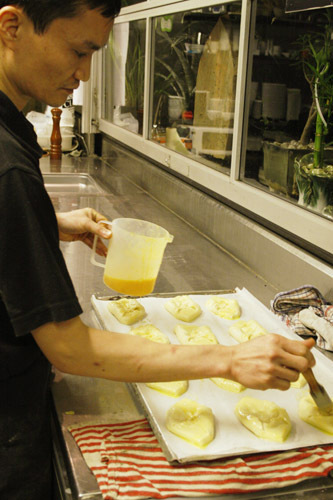 Pastry Chef Tony brushes some egg yolk on pastries to give them a beautiful shine before putting them in the oven at 220 degrees for 15-20 minutes. 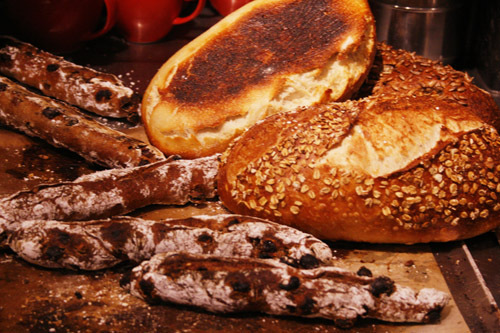 There is nothing like the smell of bread and pastries coming out of the oven! 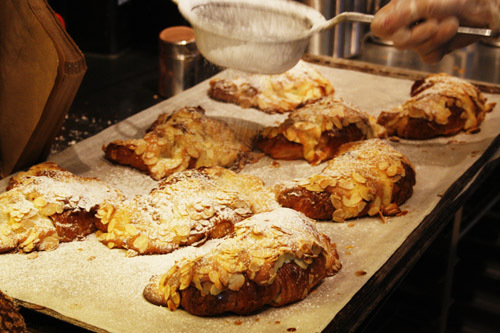 Thi sprinkles some snow sugar on the Almond Croissants. 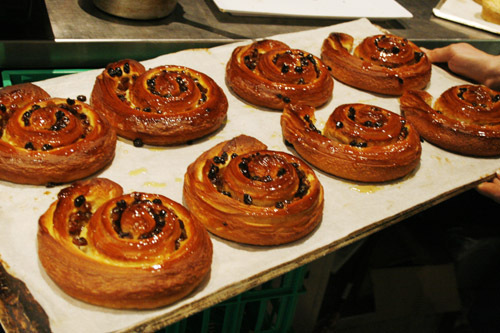 The Snails and Danish pastries are brushed with some apricot flan gel to give them this beautiful shiny aspect. The breads are ready to be placed in the display. It’s 7am, the bakery opens their doors and sleepy customers can finally buy a coffee with a warm croissant and start facing the day on a yummy note! This entry was posted in Restaurants and tagged Baguette, Bakery, Boulangerie, Bread, Croissant, pastry, Surry Hills, Taste Baguette, Taste Bakery. Bookmark the permalink. It is 3.30 on a Friday afernoon as I read this and wow I am now drooling and craving a gorgeous butter croissant. 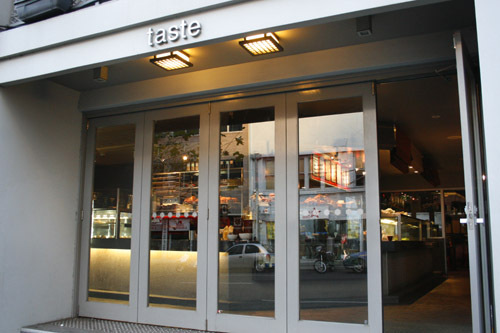 I think I will be paying a visit to Taste. When I was at boarding school in Orange we “discovered” a Vietnamese/French Bakery, these were my 1st tastes of ‘to die for’ croissants, all manner of cakes & the like (I was in love for the very 1st time); sadly I’ve rarely found breads & croissants to match it until I travelled to Vietnam & found Hanoi & in broken English asked for my absolute fav Pains aux Raisons only to be met with regails of giggles & laughter….., it seems I’d memorised the name of my hearts desire…. complete with Vietnamese accents! Busted! I was hopelessly addicted to their almond croissants when I worked in the area. I’ve tried many others, but theirs are the best! When are you going to make them yourself, now that you have seen how to do it ! Wow, what a fantastic find… I’m so keen to try it… of course, I knew the French had a big influence on Vietnamese bakery, but have not found a nice one (ie not the ubiquitous hot bread shops). Will definitely give taste a go! @Sarah Hope you’ll like it as much I do! @Anna Going to Hanoi in January, can’t wait to try the food there! @Franny Now that’s just crazy talk! Hey Sandra, so they have a restaurant in Chinatown? I’m craving almond croissants right now, these look so appetising! 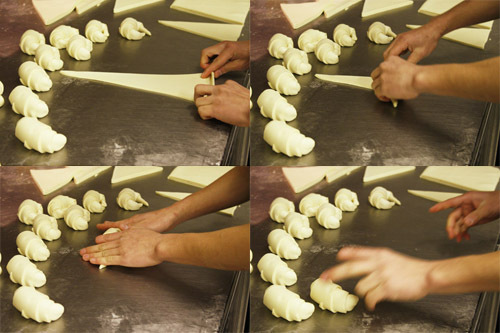 I like the photos of the pastry getting rolled into croissant shape. Must be quite an art to get them all looking the same! The baguettes sandwiches are all fantastic, definitely worth going back and the salads are excellent too. An excellent address and the croissants are indeed fabulous.